In February 2019, I received an email from Leon (“Leo”) Filipczak, a Wisconsin teacher, on behalf of Zabian, one of his students, who was working on a project that they rightfully suspected would be of interest to me. Leo was blown away by the research skills Zabian acquired and said he’d not seen Zabian work this hard before on a school project. He wanted to do a project on the Golden Age of Comics. 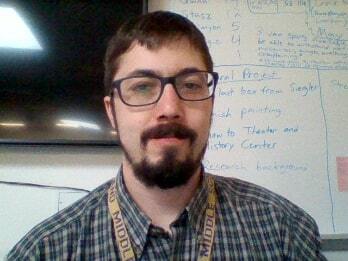 I wanted him to make it academic enough to compete in National History Day. Little did we know that several months later, he’d be down the Bill Finger rabbit hole, in contact with Athena Finger and Marc Nobleman, and have advanced to the statewide competition. Plenty of academic and life skills would be acquired along the way. 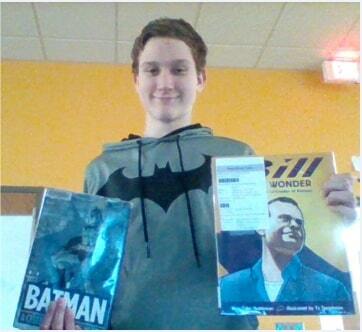 Zabian, an 8th-grade student from northern Wisconsin, returned from Madison on 4/13/19 having entered a website on Bill Finger’s life into the National History Day event. National History Day is a science fair-like competition for middle and high school students that emphasizes primary historical research. Every year, NHD has a theme, and for 2019, it was Triumph and Tragedy. I was doing a project on Batman and I found a little article about the Bill Finger story. I don’t even remember which article—maybe it was one by Marc—but I found out there was a controversy about Bill Finger and the creation of Batman. So then I watched Batman & Bill and it really got me interested in finding out about the lies and everything that led up to the movie. I thought it would fit very well with the History Day theme because his entire life was triumph and tragedy. I have been a Batman fan my whole life, but I didn’t know anything about Bob Kane, or especially not Bill Finger, so this was all new. From the movie, Zabian branched out to Marc’s TED Talk, Bill the Boy Wonder, and other sources. I tried to push him toward placing Bill’s life into the larger context of 20th-century American history. As a history teacher who has Elfquest, Persepolis, and Watchmen on his shelf but who has never had more than a superficial interest in the DC and Marvel superheroes, I was still somewhat skeptical of the academic merits of the topic. Another student in the class was doing a Stan Lee project and one thing that struck us was that Stan Lieber [Stan Lee], Bob Kahn [Bob Kane], and Milton Finger [Bill Finger] had similar backgrounds. They were sons of Jewish immigrants, grew up on the mean streets of New York during the Depression, went to the same high school (along with Will Eisner), adopted pen names, and got into pulp publishing very young in what was seen as a low-brow, entry-level sort of industry. It felt like a very American story. I convinced Zabian that it would be worth looking into Bill’s genealogy and we managed to track down the 1940 census record that showed Bill was still living at home and working in the shoe store even as Batman was starting to take off. We also found Louis Finger’s naturalization record from 1919, which contained some interesting details and led to some good discussions of the history of American immigration. I was able to talk about my great-grandfather, who immigrated from Austrian-ruled Galicia (now southeastern Poland/western Ukraine) five years before Louis, so this was one of my favorite parts of the project. From the documentary, I knew I would have to contact Marc and Athena at some point. I didn’t know for sure if they would respond, because I had never tried to randomly contact a famous person before. Maybe they would be busy and wouldn’t care about some kid’s project. Both of them responded, though. Athena gave me a lot of quotes, and let me put them on my site. Marc gave me some websites. They both seem like very nice people. Zabian won the middle-school website category at the northern Wisconsin regional in March and advanced to the statewide contest. This is not typical for a first-year competitor. And although he did not advance to national competition, he demonstrated skill and perseverance that surprised his teachers, his peers, and himself. It definitely gave me a lot of new skills that I never used before. This was, by far, the biggest school project I’ve ever done. Bill Finger is one cool dude. Oh, he even found something I had not seen before—the petition for naturalization. Congrats, Zabian, and thanks to you both for sharing your story. I’d bet Bill would be honored. Zabian did some great work!